In the dog days of summer, there is nothing more excruciating than laboring over a fiery stove or sticking your hands (& face) into a 375 degree oven. So in an effort to stay cool, I self-imposed a “No-Cook, No-Bake” challenge. Meaning out of the 3-4 creations coming out my experimental kitchen every weekend, one dish CANNOT be the product of the stove or oven. This weekend, I was inspired by my recent travels to the heavenly Greek Islands (separate blog post to follow on the local eats and feasts! 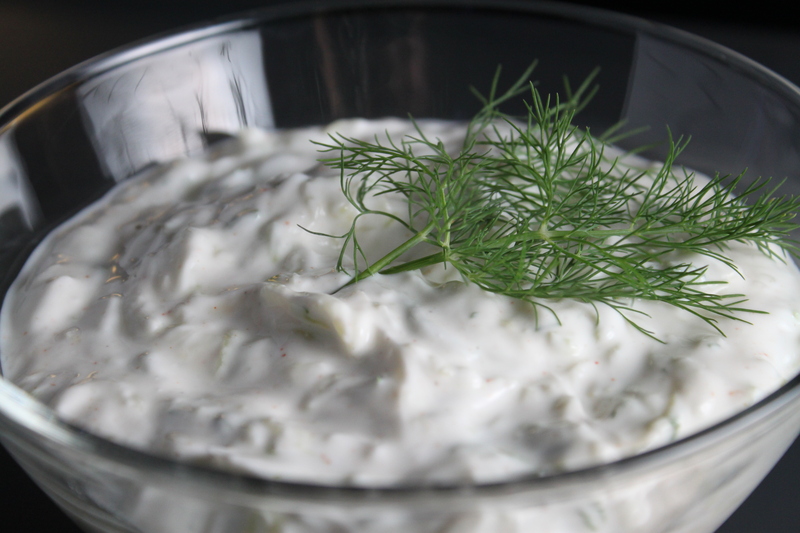 ), so I decided to make a refreshing Tzatziki to remember my blissful days under the Grecian Sun. 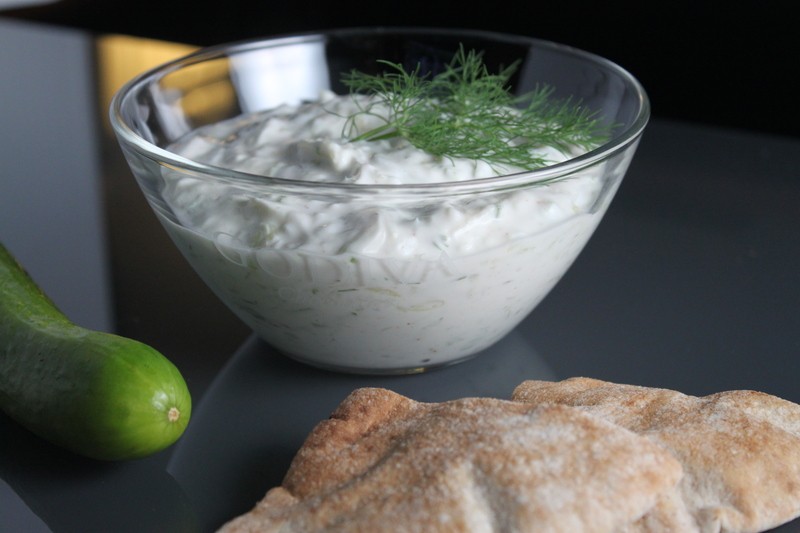 Mix the yogurt and cucumber together. Add in the dill, sour cream, lemon juice, garlic, red pepper flakes, cayenne pepper, salt & pepper and mix well. Let sit in the refrigerator for 1-2 hours (1 hour MINIMUM) for flavors to develop. This is the most critical step, but given the short prep time and the amazing flavorful results, it will be worth the wait! Once upon a time, in the Golden State of California, a little girl grew up basking in the radiant rays of sunshine. Her little cozy ranch house boasted a mini orchard with succulent fruits like apples, oranges, kumquats, & avocados. The organic garden her mother cultivated gave life to fresh tomatoes, basil, squash, and yam greens. These essential greens (and reds, and yellows) nurtured her little body & soul, and she grew up to be a vegetarian. In a land 2500 miles away in the heartland of America, a little boy grew up in the wholesome state of Ohio. There, the people were jolly and warm, and the meals big and hearty. Juicy steaks & creamy potatoes gave the boy strong bones & muscles, and he grew up to be an “equal opportunity eater”, more commonly known as an omnivore. Two decades later, the playful hands of fate brought this little girl and boy together in the concrete jungle of New York City. As different as they were in their diets, they shared a common love for food (and each other), so they often had to get creative with their flexitarian menus and two-pot meals. Until one day, a Fairy Chefmother, Giada DeLaurentiis, waved her magic spatula and showed them a recipe that was vegetarian but tasted like meat. The little girl and boy devoured the dish completely, and lived happily until the next meal. 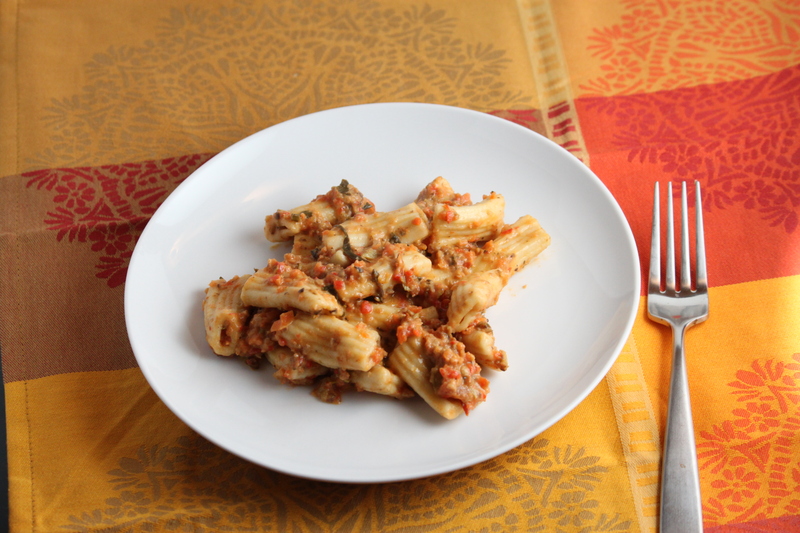 This is my variation on Giada’s Rigatoni with Vegetarian Bolognese. I opted to make my tomato base from scratch, substituted seasonal spring ramps for onions, and picked my favorite herbs – thyme, basil & tarragon. What I kept constant (and believe it’s critical to) is the mascarpone and the mushrooms, which give it the “meaty” taste that serves to trick all carnivores! In a skillet, heat up some olive oil. Transfer the finely chopped into the skillet, season with salt & pepper & herbs, and cook for 5-7 minutes, until vegetables are cooked. Drain the pasta and transfer to the vegetable bolognese sauce. Mix well, adding some pasta liquid if mixture is dry. 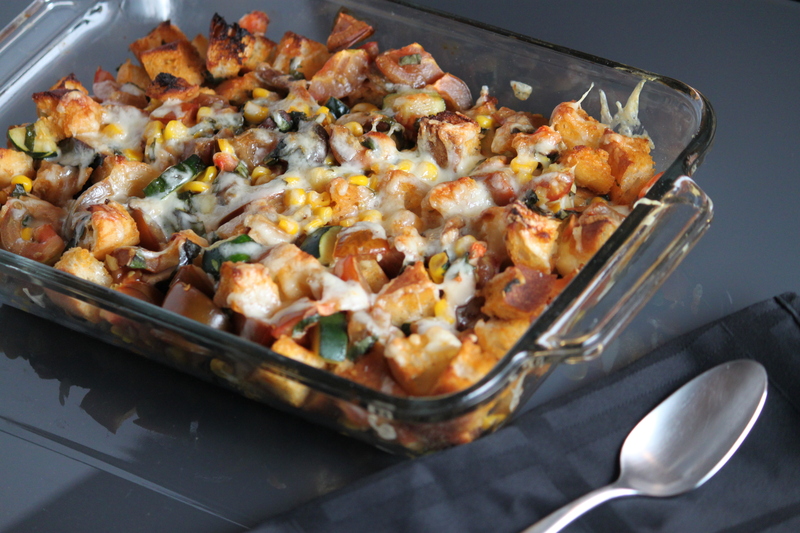 Sprinkle with parmesan and take a huge satisfying bite into it! This morning, the sun’s golden rays graced New York City with the first true day of Spring. Donning a summer dress & flip flops, I pranced out of my apartment eager for the first taste of 75+degree weather. As I took in the sights of scarlet red tulips, golden daffodils, and pretty-in-pink magnolias blossoming all around us, I stared in amazement at this seemingly sudden arrival of Spring. Surely this transformation didn’t happen overnight, but when one has been as absorbed in work as I have been in the past few weeks, it’s easy to let the world slip past you in the blink of an eye. It was at that moment when I decided to reclaim the balance in my life, to make sure that I pay proper attention to things I love and enjoy – cooking up a storm, blogging up a bigger storm, curling up with a good book, and taking the time to just be. My balance comes from my freedom to unleash my creativity, to draw inspiration from things I see, hear, smell, and taste, and create something that I can call my own. 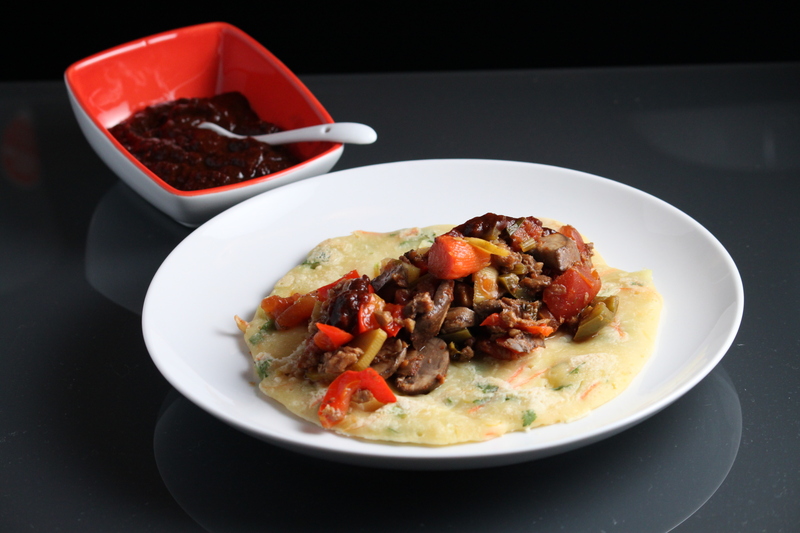 So it is with the same explorer’s attitude that I cook up this Korean-Mexican fusion with Korean Pajeon pancakes, and Latin-flavored fillings and sauce. 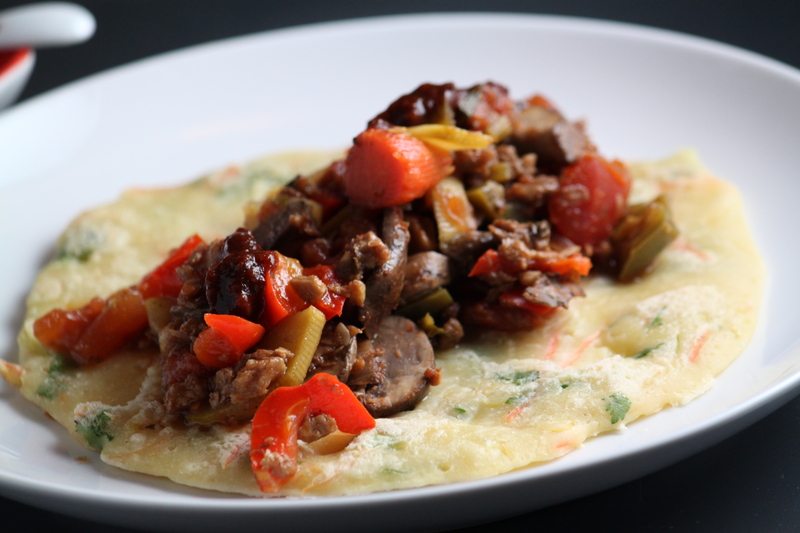 The flavors are nothing foreign to me, but the combination of smoky, spicy veggie fillings wrapped inside a rice-flour crepe-like pancake instead of the usual corn-flour tortilla introduced a new refreshing twist to an old favorite. This is a 3 part recipe, which may seem daunting and complicated at first glance, but once you get the prep work out of the way, it’s very straightforward and easy to put together. Directions: Mix the batter together until well integrated and texture is smooth. Throw in the veggies and herbs, soy sauce, and in batches, spoon out batter onto an oiled frying pan. Spread out batter so it is about 1/4 inch to 1/2 inch thick, turn heat to medium-low and when batter sticks together, flip to the other side and cook until pancake is crispy and gives off a golden brown hue. Directions: Take out 1-2 chipotles out of the can of chipotle en adobo sauce (plus a few spoonfuls of the thick sauce itself). I find these extremely spicy so you should only need a couple to get that smoke and spice into the sauce. Finely chop the chipotle, or process in a small food processor. Mix it into the tomato sauce, add paprika and the vinegar and mix well. There was a time in my earlier twenties when I shed my structured, organized life in exchange for spontaneity. During that time, the thrill-seeker in me longed for adventures and allowed myself to be seduced by the unknown. Each weekend brought about endless possibilities; each work project offered the promise of exotic travel locales. I loved that I didn’t have to report my whereabouts to anyone, and could pick up at a moment’s notice if Jetblue was offering flight deals. As I cultivated that relationship with myself over the years, I have also come back full circle to my original roots. Naturally a Type A planner, I’ve come to embrace the new routines of my more settled life. Work, weeknight dinners with the girls, indulging in Gossip Girl and American Idol, dragging myself to the gym, and then….welcoming home my man every Thursday night as he dependably lands in Newark Airport at 9:36pm. Weekends still offer exciting variations of dinner parties, birthday gatherings and double/triple/quadruple dates, but the one “couple tradition” we hold very near and dear is our lazy Sunday of gym, laundry, catching up on HBO shows, and enjoying a simple meal of leftovers or a creation inspired by ingredients leftover from the week. 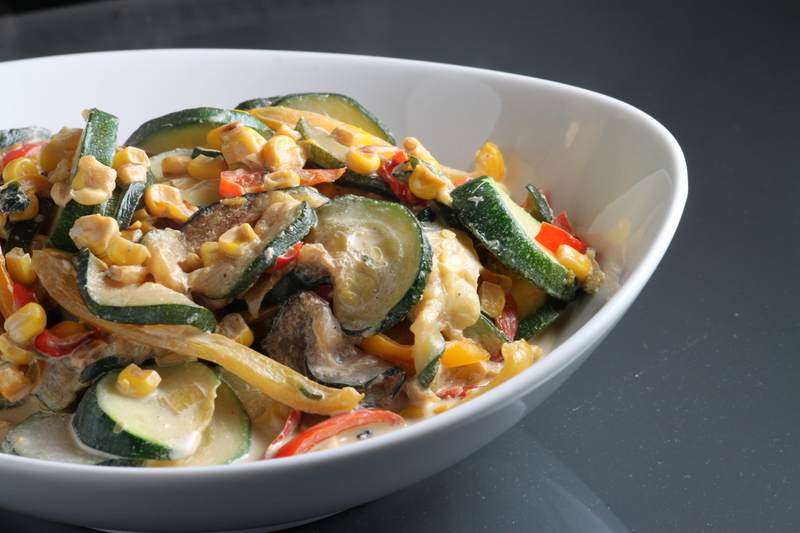 This succotash features corn and zucchini as the star ingredients. 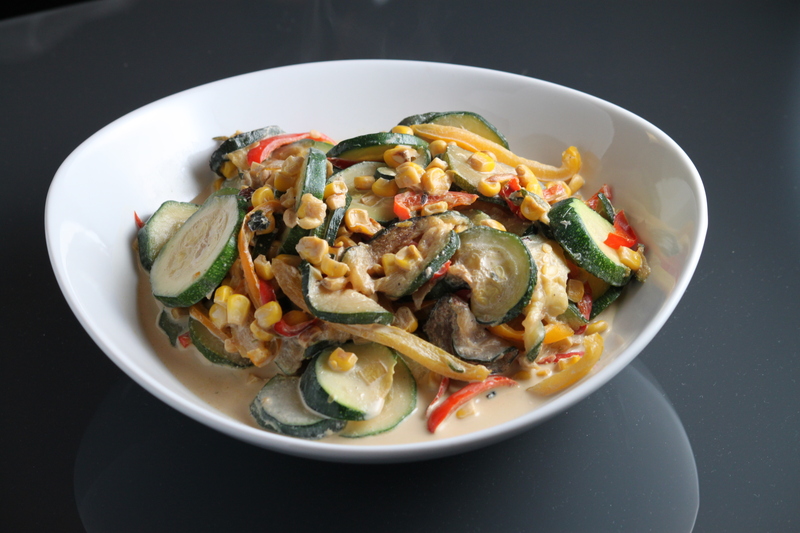 While it may not be the most traditional, the crunch of fresh veggies drenched in creamy sweetness will transport you into a world of ease and relaxation. It takes but minutes to put together and it’s exactly what we needed to wind down the weekend and welcome in another busy week at work. We’re taught that the key to maintaining our figure when surrounded by so much food creations is to eat in moderation. But once in awhile, we all encounter a dish that we take a “test bite” of and then just can’t resist going back for more! Before you realize it, you’re making another batch just so you can serve a presentable looking dish to your dinner guests. The other day, I was bitten by the “can’t stop eating” bug when I made this highly addictive and extremely simple bread pudding. Dig in with a spoon and don’t resist the temptation to keep on eating! As a child, I could never contain my excitement every time Halloween rolled around. I loved the mystery of not knowing what candy “swag” I would find in my bag at the end of the night, visiting the houses with the most terrifying Halloween lawn decor, and the costumes lovingly (though perhaps not skillfully) made by Mom. 20 some odd years later, this excitement has not faded, but my anticipation for candy has been replaced by an eagerness to brew up new spooktacular recipes, the lack of horrific suburban lawns has been made up by my proximity to the NYC West Village Halloween Parade, and the role of costume seamstress has passed on to me, making me realize that Mom was a much better costume maker than I ever will be. Boil and torture the head and fingers until soft and tender. Drain liquid, and add salt & pepper. Mix with a spatula. Shape the mash into skulls and bones. 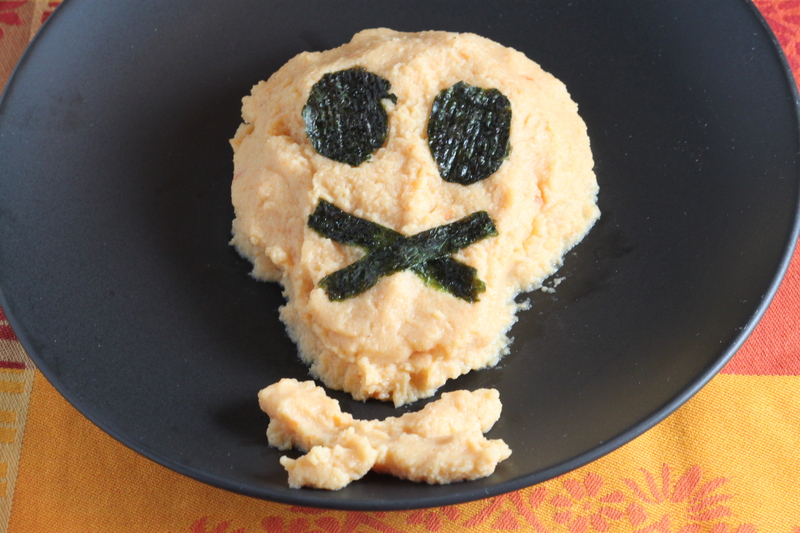 Take the sheet of seaweed, and with a small knife, cut out circles (for eyes) and thin strips (for a “X” shaped lip). Fire Burn and Cauldron Bubble! 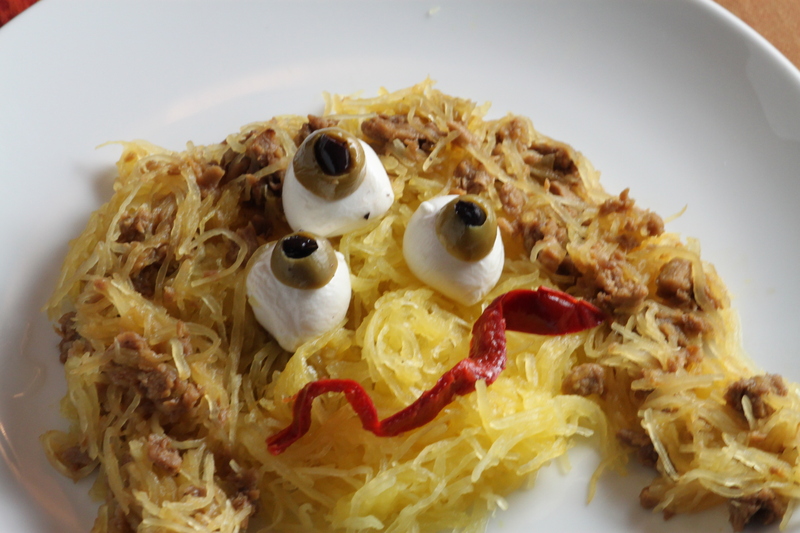 Cut the spaghetti squash in half lengthwise, rub with herbs and olive oil, and roast in a 400 degree oven for 30-40 min. 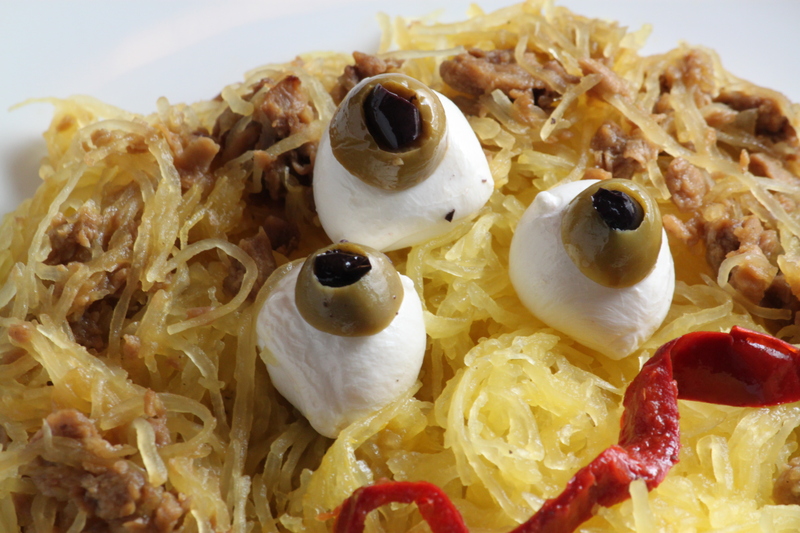 Arrange the squash to create a round face, framed with worm-infested hair, stick a couple of creepy eyeballs on top and around, and garnish with a fiery mouth. Sometimes I think the Southern Cali in me will never get used to the changing of seasons in the Northeast. If I could, I think I would wear flip flops and sundresses all year round. But the arrival of Fall, with its crisp refreshing chill in the air, was a wake up call for me. I’ve been immersed in my warm bubble of vacation-traveling and nest-building so long that I’ve neglected this little corner of blog haven. 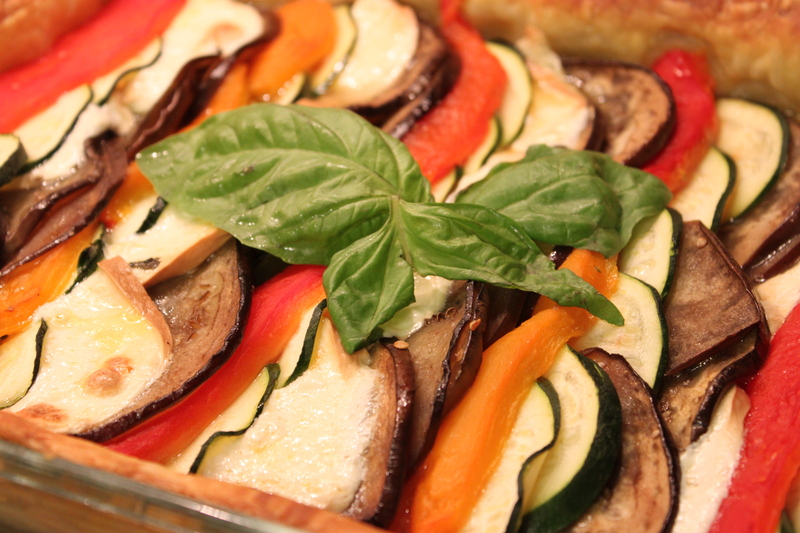 But before I succumb entirely to Fall just yet, I want to share one more dish that to me, captures the essence of summer sunshine – the Ratatouille. 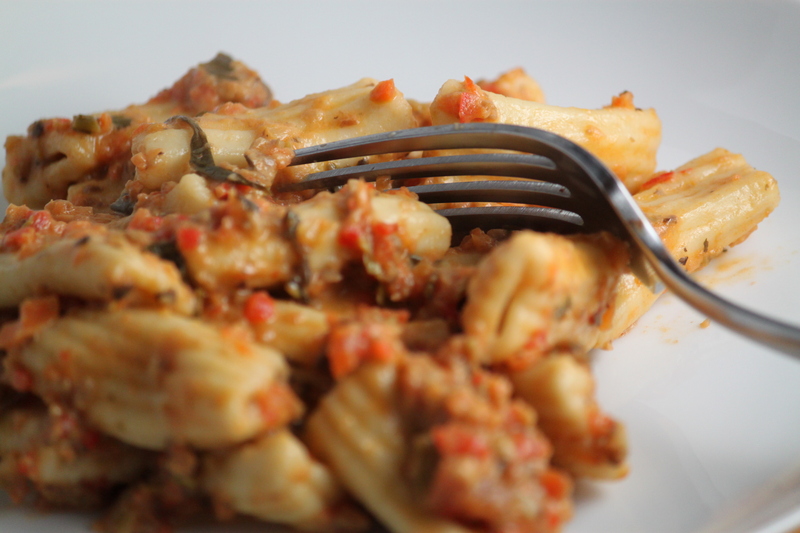 Popularized by Remy the lovable rat in the Pixar film, this veggie-centric dish represents everything pastoral, natural, and simply honest about food. There is no fancy work involved, yet every bite bursts with nostalgic flavor that takes you back to that imaginary country cottage in Provence on a lazy summer’s day. 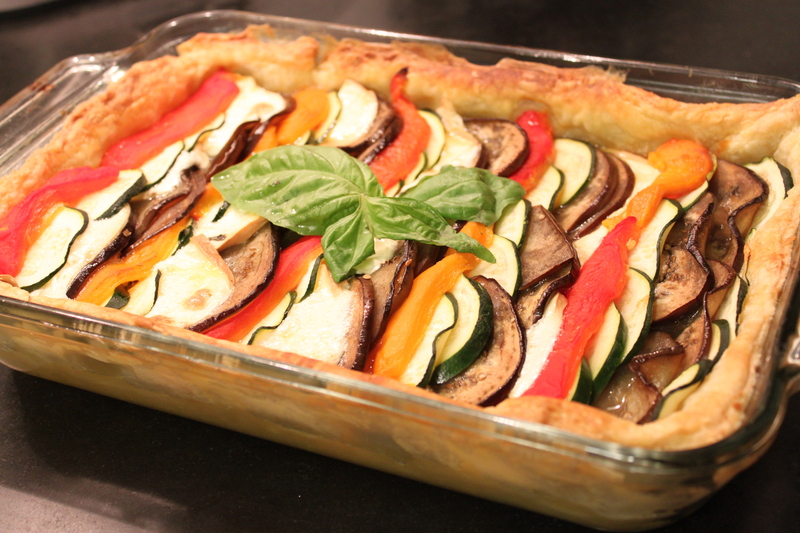 This is my favorite version after numerous experimentation, inspired by the layered aesthetics of the Ratatouille in the film, and incorporating my favorite ingredients. Smoked mozzarella adds a subtle hit of the unexpected and creates satisfaction as you work your way through the stringy glory; my tomato mixture (which you can’t see) has just a touch of cream to sweeten and a kick of tarragon for warmth; finally the puff pastry crust not only provides a delightful crunch and but holds it all together nicely. Smell it, taste it, devour the RATatouille! Preheat Oven to 350-375. Defrost the puff pastry sheets and spread over baking dish. Make the tomato sauce: Cook the chopped tomatoes, tomato paste, onions, and garlic over medium heat until sauce thickens. Add water or more paste as necessary. Add in salt, pepper, tarragon, basil and stir. Slowly incorporate the half & half and agave and adjust until you reach the desired balance of acidity and savory. Precook the eggplant. I find this step extremely important unless you’re using Japanese eggplants which cook more easily. Saute the eggplant slices in olive oil over medium to high heat and flip on other side until cooked and soft. Spread the tomato sauce into the baking dish on top of the puff pastry. 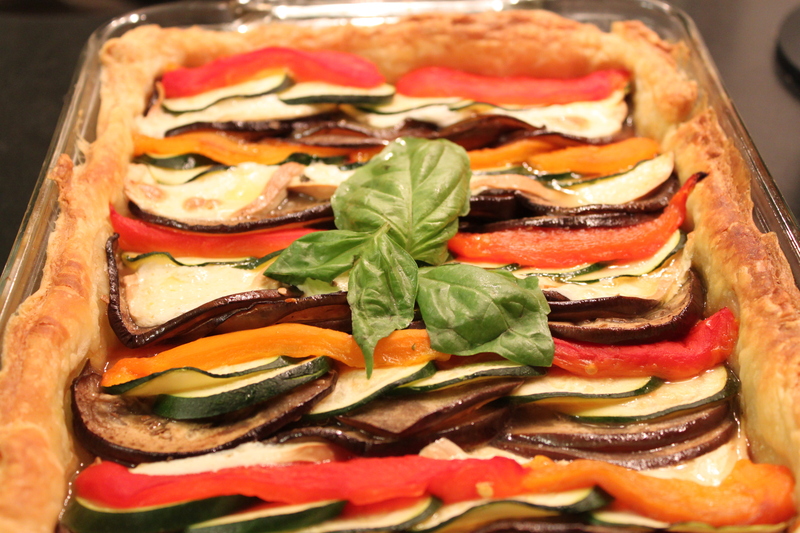 Then layer the veggies and cheese on top (eggplant, zucchini, bell pepper, cheese, and so forth). 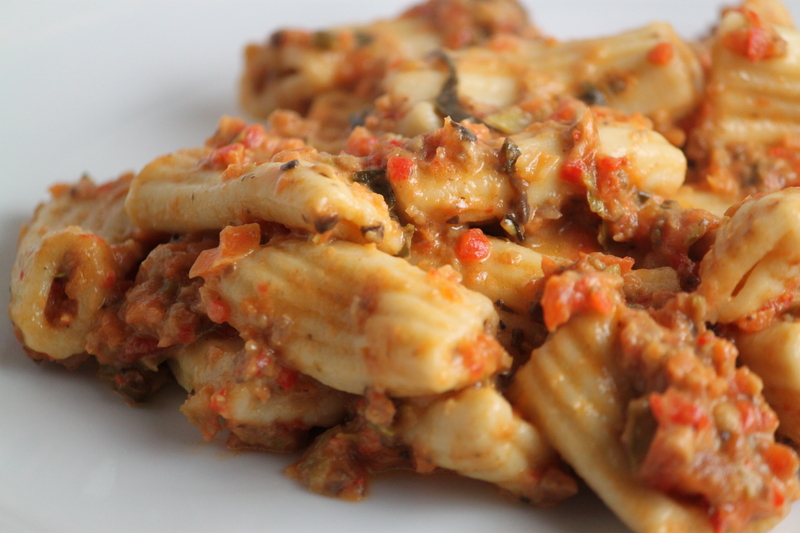 Drizzle or brush with olive oil and sprinkle the mixed herbs & spice mixture on top. 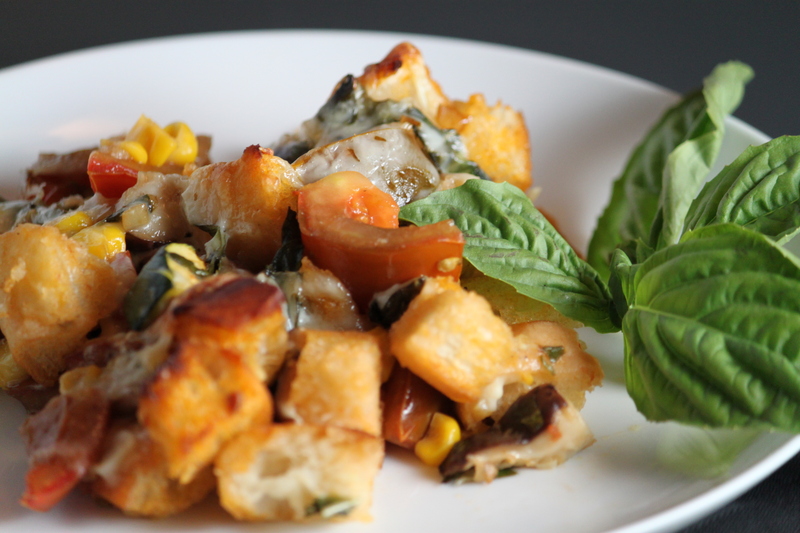 Bake for about 40-50 minutes until puff pastry is golden brown and vegetables and cheese are bubbly without being overcooked. And on this note, I give Summer one last forlorn glance and spring forward to welcome Fall in all it’s glory. Hello to pumpkins and squashes – can’t wait for what comes next!